Garden Furniture Preservative | Which are Best and Why? Most garden furniture is made from Teak or other types of exotic hardwood for good reason. Dense hardwoods are extremely durable and resistant to the effects of weathering which makes them ideal for the construction of garden furniture so is a garden furniture preservative needed? Does garden furniture need a wood preservative? In short, if the furniture is new and made of teak or other exotic hard wood, the answer is no. Dense exotic hardwoods are naturally oily and resilient to weathering so in the short to medium term do not need preserving. Other bare wood outdoor furniture made of woods such as Oak, Pine or other softwoods should be treated with a wood preservative and an exterior wood oil or garden furniture oil as soon as possible to provide protection against mould, algae, insect attack and other biological threats. When does garden furniture need a wood preserver? 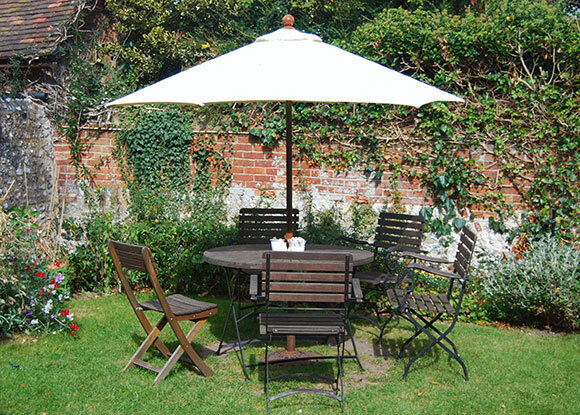 Garden furniture can be treated with virtually any exterior wood preservative either water-based or solvent-based. Solvent-based preservatives often have deeper penetration and dry quicker whilst water-based preservers are more user and environmentally friendly. For new softwood garden furniture or perhaps aged furniture where the greyed or weathered colour is desired, use a clear wood preservative. Garden furniture can also be coloured / stained and preserved at the same time by using a coloured wood preservative. Barrettine Premier Wood Preserver: A general purpose, solvent-based high-performance exterior wood preserver suitable for all garden wood. Available in clear and a range of colours. Ronseal Total Wood Preserver: A highly penetrative, solvent-based wood preserver suitable for garden furniture and all other exterior wood. Available in clear and a range of colours. Ronseal Shed and Fence Preserver: A coloured shed & fence preservative that colours, preserves and nourishes wood. Can be used on all garden wood including garden furniture. Not available in clear. Wood preservatives offer little in the way of weather protection and should always be over-coated with a garden furniture oil, or other suitable exterior wood oil once fully dry. The oil top-coat seals in the preservative to extend its effective life and provides weather resistance to the garden furniture. The oil can then be topped up or maintained by simply applying a thin maintenance coat every year or 2 depending on location and exposure to the elements. Alternatively, wood preservatives can be over-coated with a compatible garden furniture stain or garden furniture paint. Wood preservatives are designed to prevent mould, algae, insect attack and other biological threats, they will not treat or eradicate existing growth on the wood. If garden furniture shows signs of mould or algae, it must be treated with a garden furniture cleaner before applying any preservative. Garden furniture cleaners not only clean the visible effects of mould and algae on the wood but also kill off the spores embedded in the wood grain that would otherwise regrow. Once treated and dry, a wood preservative can be applied to prevent future attack. As wood preservers contain biocides and other ingredients to protect the wood, it’s important that they are over-coated with a compatible top-coat to seal away the preservative and prevent direct contact. If the aim is to paint your garden furniture, its worth mentioning that many wood preservatives contain a small amount of wax to provide some limited weather resistance and prevent water from penetrating into the timber. Many exterior wood paints and garden furniture paints are water-based and as a result, are not suitable for painting over a preservative that contains wax, oil or silicon. If garden furniture is to be painted, always get a preservative that does not contain wax, oil or silicon. These preservatives are ideal for garden furniture that is going to be painted with a water-based garden paint, varnish or stain. When using any type of wood finish, it is always recommended to do a test area to assess product suitability and final finish before starting any project. Products can usually be tested on the underside of garden tables and chairs where they wont be seen.